It was a new day, a new event, but a familiar face once again captured the title. 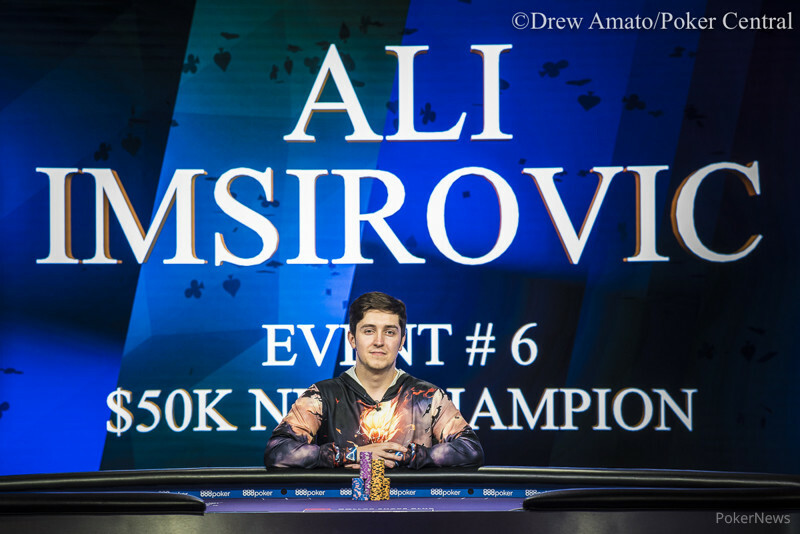 Ali Imsirovic came out on top of Event #6: $50,000 No-Limit Hold'em to capture back-to-back titles at the 2018 Poker Masters. Imsirovic will pocket a cool $799,000 for his win after defeating Koray Aldemir who will take home $517,000. This victory will serve as Imsirovic's largest ever cash in his early career and he has now won over $1.2 million so far in this year's edition of the Poker Masters. With the win, Imsirovic added another 300 points to his total in the Purple Jacket race and has moved into a comfortable position atop the leaderboard. "I was thinking about that last night," Imsirovic said when asked about his recent run of success and how it translates into the Poker Masters Purple Jacket race. "I was just happy to be at another final table. I knew I could take over the lead with another good showing. But with the Main Event coming up, I think I'll save the partying for later." 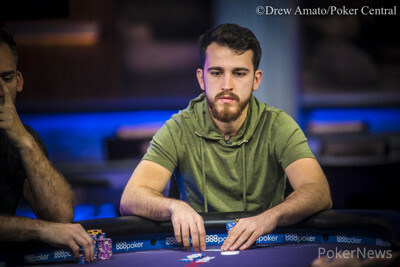 Imsirovic came into the day with over half of the chips in play and things continued to roll his way in the early going as he eliminated Justin Bonomo in sixth place. Bonomo lost a crucial pot in the early going with ace-king suited against Aldemir's pocket kings and was unable to recover. The next short stack to fall to Imsirovic was Sam Soverel when he stuck in the last of his seven big blinds with ace-king but Imsirovic woke up with pocket queens. Jake Schindler had another rough day at a final table as he was just unable to get anything going his way. Stuck with a little under 15 big blinds, Schindler was facing an all in from Imsirovic and called it off with pocket fours. Imsirovic was lucky to have two overcards with seven-five offsuit and spiked a five on the flop to send Schindler home in fourth place. That left Seth Davies on the short stack and he was caught off guard when Imsirovic flopped two pair against his pocket tens. While Imsirovic made quick work of all the short stacks at the table, Aldemir was happy to watch the action unfold and make his way into the heads-up battle. Things started off strong for Aldemir who wasted little time before taking over the chip lead. It looked as though Imsirovic's good fortune had run out but he quickly put those doubts aside. Aldemir limp-called a shove from Imsirovic with ace-five suited. Imsirovic was up against the ropes with jack-ten but flopped Broadway to score a double up. The chip lead swung back and forth over the course of the heads-up battle that took nearly 100 hands to complete. Aldemir picked off several bluffs from Imsirovic with just a high card but that still wasn't enough to lay claim to the title. Imsirovic proved to be relentless with his aggressive style in the big blind and Aldemir had no answer for it. With the German sitting on 10 big blinds, he shoved all in with nine-eight and was snapped off by the king-queen of Imsirovic. A queen on the turn locked up the win for Imsirovic as he raised his arms in victory. Heading into the final event of the series, the $100,000 Main Event, there are only five players still eligible for the Purple Jacket. Brandon Adams jumped out to an early lead in the points race but has since fallen to second place. Isaac Haxton sits in third place after a victory in Event #4 and Jake Schindler has moved up the ranks after yet another final table today. Ben Yu is the only other player eligible to compete for the Purple Jacket as he rounds out the top five. That brings an end to the coverage of another final table at the 2018 Poker Masters. However, the $100,000 Main Event is underway and you can follow all of the coverage throughout the 3-day event at PokerNews.com. With Koray Aldemir down to around 10 big blinds, he shoved all in with on the button. Ali Imsirovic quickly called in the big blind with and the cards were tabled face up. The flop of was no help to Aldemir and the on the turn would leave him drawing dead to the river. Imsirovic's pair of queens was good enough to finally bring an end to the heads-up battle as Aldemir was forced to settle for second place. Ali Imsirovic just called on the button again with and Koray Aldemir elected to check his option with . The flop came and both players checked to the on the turn. After a pre-exposed river card, both players checked again and the new river was the . Aldemir tossed in a bet of 360,000 and Imsirovic quickly called with his pair of tens. Ali Imsirovic limped in on the button with and Koray Aldemir checked his option holding . The flop fell and both players checked to the on the turn. They checked again to see the on the river and Aldemir checked one more time. Imsirovic finally threw in a bet of 300,000 with his pair of fours and Aldemir called with a pair of threes. Koray Aldemir limped in on the button with and Ali Imsirovic raised to 350,000 in the big blind with . The action was back on Aldemir who shipped all in which prompted a quick fold from Imsirovic. With both players sitting on around 30 big blinds, the majority of the pots in this level have seen all in and folds preflop. It should only be a matter of time before all of the chips get in the middle. Koray Aldemir limped in with on the button and Ali Imsirovic shipped all in for 1,975,000 with . Aldemir instantly called and had Imsirovic on the ropes. The dealer fanned the flop of and Imsirovic flopped a straight to take a stranglehold on the hand. The on the turn left Aldemir drawing dead to the on the river. Imsirovic scored a big double to jump back into the lead as the pendulum swings again. Koray Aldemir and Ali Imsirovic are taking a break as the level has come to an end.